A lot of interesting information about dogs is presented in our previous newsletters and today we would like to discuss some interesting facts about your favorite four-footed friends. As the saying goes: ‘’Dogs are man’s best friends’’. It is a wonderful domestic animals that offer a number of benefits and pleasure. Enjoy these fun facts that will give you a great variety of information about interesting dog breeds, puppies etc: 1) It is known that there are around 400 million dogs in the world; 2) Dogs perform different useful activities for humanity, such as farm work, security as well as assisting people with disabilities such as the blind etc. ; 3) Dogs have superior hearing than humans; 4) According to the facts, the most popular dog breed in the world is Labrador. With their gentle nature, obedience, intelligence and endless energy, they are excellent family pets and reliable workers. They are often a common choice as guide dogs. Spend your free time with pleasure and get to know more interesting information about your beloved pets in our newsletters! 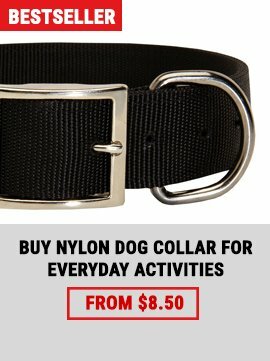 We can make this collar to fit dogs with neck size 18 inch and up to 26 inch (45 cm - 65 cm) This Collar Is Extra Wide - Almost 1 3/4 Inch - Which Makes It Perfect Tool For Handling Large And Active Breeds This Nylon Collar Is Made With Symmetrical Proportional Silver Conchos!That Help Bring Out The Beauty Of This Hand Crafted Creation. We Used Only Silver Plated Hardware ! Available In Black Very Strong Water Resistant Nylon "Functionally fashionable". 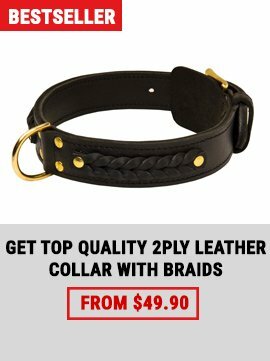 This Luxury Leather Dog Collar is 1 3/4 Inch Wide - Which Makes It Perfect Tool For Handling you all dogs. Our Handmade Leather Collar Is Made With Symmetrical Proportional Vintage Look Rusted BIG Plates!! 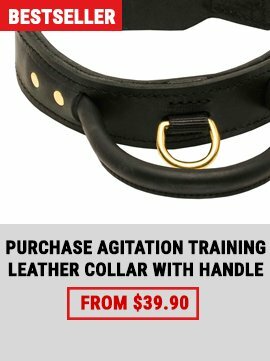 This Designer Leather collar Available In Tan(natural),Brown or Black and Very Strong and Thick Perfectly Oiled and Selected Leather! !